Now that the weather is getting colder, snowbunnies and ski bums alike are starting towards the mountains, thinking about the perfect powder. 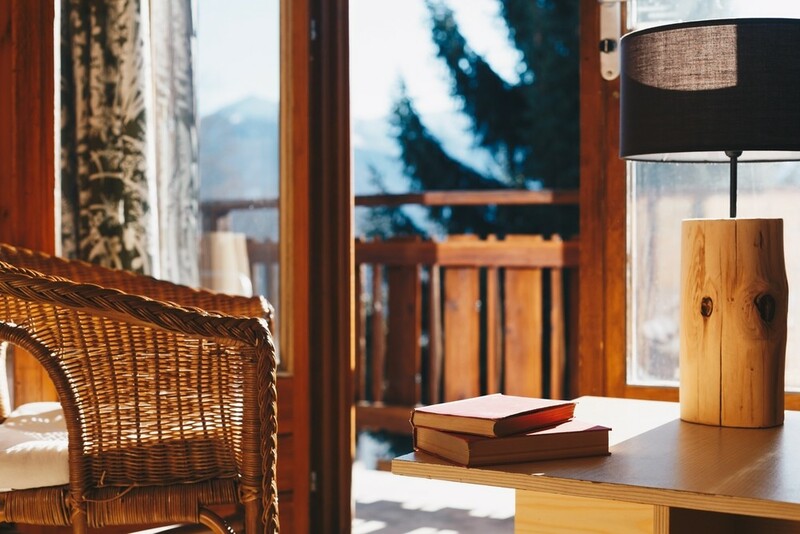 If you’re lucky enough to have a vacation home in the mountains, you know that the small details are really what make the difference between a personalized, thoughtful retreat, and a generic hotel room. Most mountain lodges are spacious, and make the most of their beautiful views. This means large windows, high ceilings, and often a loft. However, that airiness can also get chilly, and so decor elements bring in some warmth with things like textured wood. This might include exposed beams, paneling on the walls, or even a showpiece like a finished heartwood coffee table. Nothing is better than warming up by the fire after a day out in the cold, and so lodges will also usually have a large central fireplace and warm lighting. Woven and textured fabrics also add a cozy effect. Modern mountain decor usually features cool color schemes, with soft greys, and saturated maroon and navy shades that reflect a scandinavian style. However, some people like to go in a more western direction with buffalo blankets, Indian-pattern rugs, and cowboy paraphernalia. Exposed beams: These give a natural, homemade appearance to the structure. Potbellied stove in the center of the room: This will always add some warmth and old-fashioned charm. Wooden switchplate panels: Small accessories like this can make or break a place. Look at our unique designs here. Antlers: Not the mounted-dead-animal type? Get a similar effect with the yearly sheds that you’ll find from deer and elk. Stone backsplash in the kitchen: Lodge retreats are all about the natural elements of wood and stone. Bring it into the kitchen. Bookshelf crowded with old books: This increases the cozy feel and encourages the kind of lounging and thinking that’s perfect for a mountain vacation. Hand-crocheted blankets: Thick-weave blankets create just the kind of rustic coziness that feels so good at the end of an active day. Use cool colors and warm materials. Rustic gallery wall: Those wide-open spaced rooms can afford a little bit of wall clutter to give visual interest. So have fun with a mish-mashed gallery wall featuring outdoor scenes, family photos, and antique portraits.